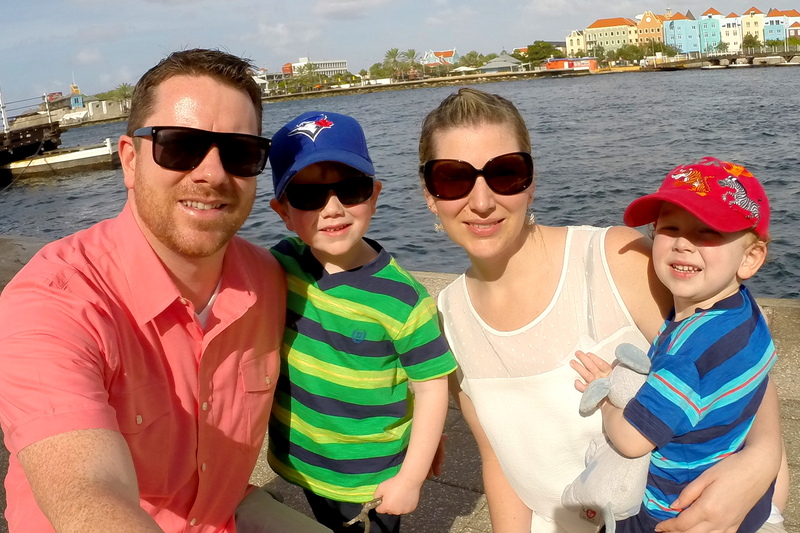 While in Egypt, we met a fun Dutch couple from Amsterdam. When we told them of our future plans to travel from Brussels to Amsterdam they both agreed that, if the opportunity presented itself, we must make the effort to visit Antwerp. Equipped with a 10-segment rail pass that allowed 24 hours to complete each trip segment, we strategized how to squeeze in a day trip to Belgium’s lesser known city. 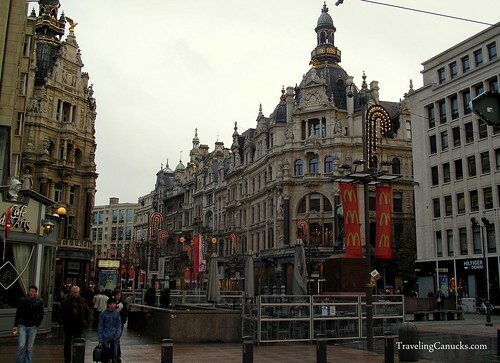 After studying the maps and train schedule, we realized that Antwerp was located right in the middle of the popular Brussels-Amsterdam train route. There were several trains departing Antwerp in the evening, arriving in Amsterdam later that night. The plan came together quickly and was actually quite simple. We departed Brussels early in the morning, arriving in Antwerp late morning. It gave us about 5 hours for sightseeing and lunch, which is more than enough time to explore the historical city renowned as being the diamond capital of the world (provided you skip the shopping!). 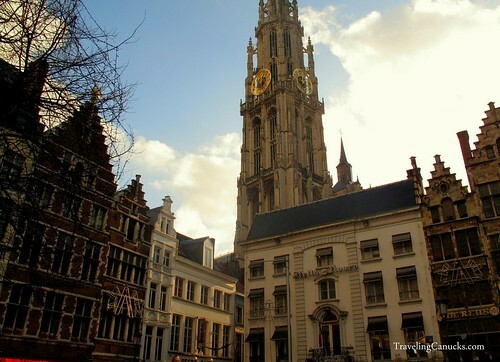 Take a walk with us as we discover Antwerp in 5 hours! Above: Business and shopping district of central Antwerp. When we arrived, the weather wasn’t cooperating. It was cold, rainy and overcast. Fortunately, as you can see in the photo below, within 20 minutes of arriving the clouds parted and the sun decided to make an appearance. Above: Pedestrian shopping streets with the towering gothic cathedral in the backdrop. Ironically a McDonald’s restaurant located on the strip (you can’t travel anywhere without the golden arches making an appearance!). Above: Nicole in the popular Grote Markt. The architecture in the main square is stunning, especially decorated for the Christmas season. Above: Colourful Belgium buildings in Antwerp’s city centre. 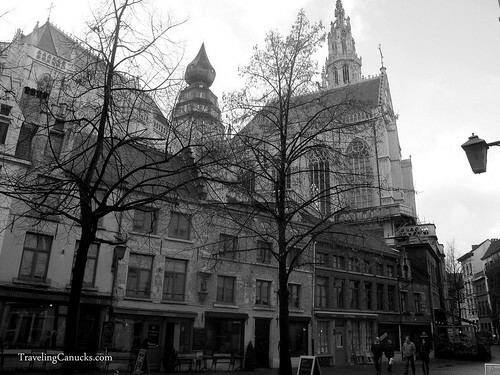 Above: Wandering the cobblestone streets of Antwerp, admiring its wonderful European architecture. You’ll notice the trees have no leaves as we were visiting in December, which was surprisingly the perfect time of year to visit Europe. 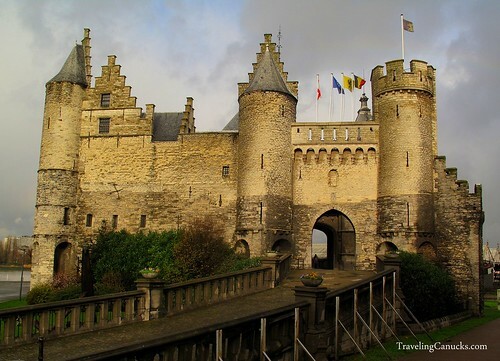 Above: The picture perfect 11th century Steen Castle, located on the shores of the Scheldt River. 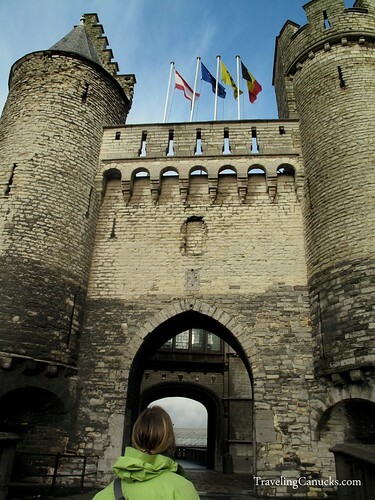 Below: Nicole at the gates of the fairy-tale, medieval castle. 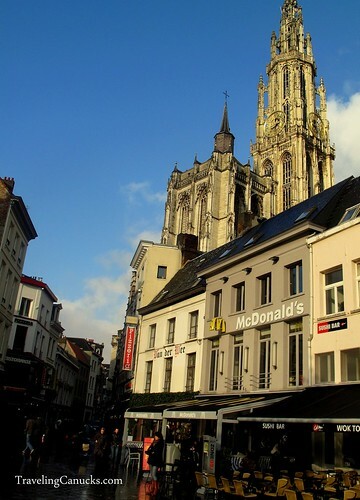 Above: The giant Cathedral of Our Lady towers over Antwerp, visible from virtually anywhere in the city centre. 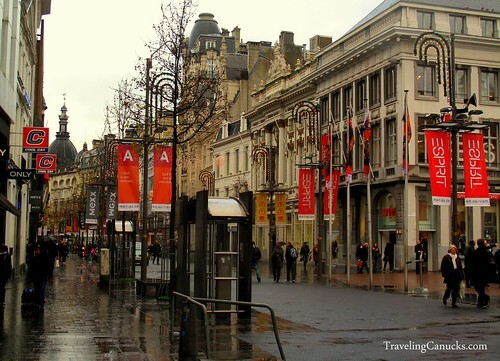 Above: Pedestrianized shopping streets in Antwerp’s city centre. 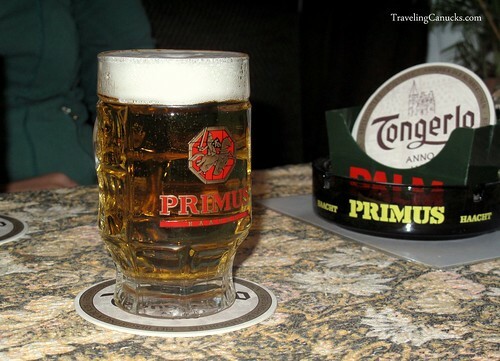 Above: A well deserved frothy pint of Primus after a full afternoon exploring Antwerp. We were glad that our Dutch friends recommended we visit Antwerp, otherwise we likely would have skipped it while on the train from Brussels to Amsterdam. It’s a beautiful riverside city rich in history and with stunning architecture. 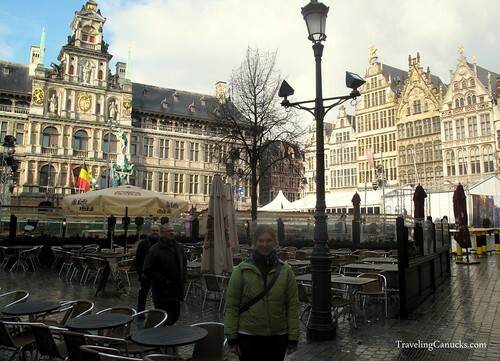 I’ve heard and seen a lot about Brussels, but nice to see some pictures and a great tour review of Antwerp. Looks like an incredible town to sit around and enjoy some beverages! Thanks for stopping by Mark. It’s a great place to enjoy some delicious Belgian beers! What a beautiful city (especially the castle and the cathedral). I’m really impressed with how much you were able to do in just 5 hours. I couldn’t help but notice that McDonalds banner in the one photo–good grief, they are everywhere, aren’t they? Looks like a good place to get a waffle! I was in Belgium for a month this summer – but never made it to Antwerp – it looks great! Sorry I missed out. Oh my gosh, it looks beyond beautiful! 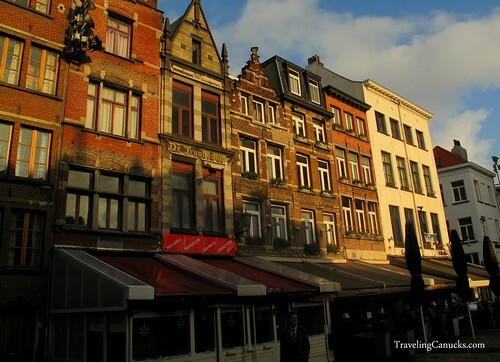 I am obsessed with Belgium and I wish we had had more time to explore there! We only made it to Brussels and Brugge. I’m adding Antwerp to my travel wish list 🙂 Thanks for giving me one more place to put on the list. I wish I had more time to go to Antwerp when I went to Belgium. Hopefully in my next trip there I will visit it. Great pics! Many of the architectural qualities I see in these pictures reminded me of Brussels. Hey Norbert – if you get the chance, add it to the itinerary. It does have a lot of similarities to Brussels, just on a smaller scale. The castle was really cool. It’s exactly how castles were illustrated in the cartoons we watched growing up! I’m overwhelmed by what fabulous architecture there is to admire in Antwerp. You caught it beautifully in your pics. Thanks Inka – it’s a definitely an attractive city! I had no idea that Antwerp had such spectacular architecture! It looks amazing! Interesting mix of modern brands with old architecture in the first photo. Nice to see they did not sucumb to neon signs. Even the McDonalds looks cool! Great photos, definitely creates a mood! Yes, indeed, it’s amazing over there. I took the time to take a 10 day trip last year and I must say it was simply amazing. Nevermind the weather, with such lovely architecture I’d stay there admiring it in the pouring rain or snow storm:)) Thks for the post, it’s a really nice feeling to see the places I’ve also been to. 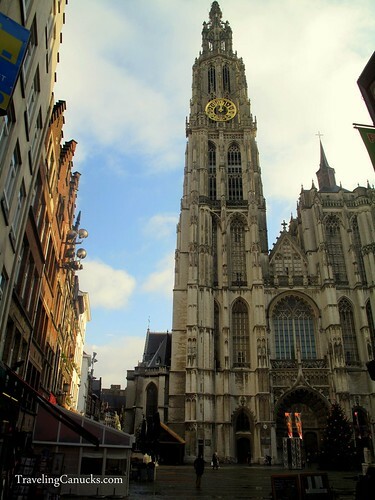 Too bad we didn’t visit Antwerp when we were in Belgium, it looks like a pretty city from your photos, especially the cathedral and the castle. The Steen Castle looks like popping out from a medieval fairy tale book! Fantastic photos guys. I’m going to Antwerp next weekend for a gig and plan on getting the train in earlier to explore the city. Looking forward to exploring the Grote Markt, Cathedral and the Castle. 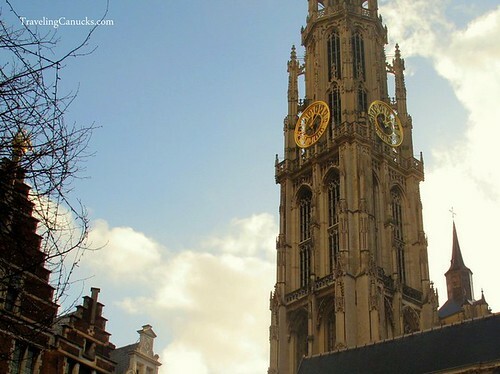 The Grote Markt and Cathedral are very cool – enjoy! I’ve travelled a lot in that region but have yet to make it to Antwerp. It looks gorgeous in your photos.